rhq, using the RHQ REST API to deploy an application to a resource managed by RHQ. as_cli, using the JBoss AS Client to deploy to a JBoss Domain. mvn, deploy the application to a maven repository. 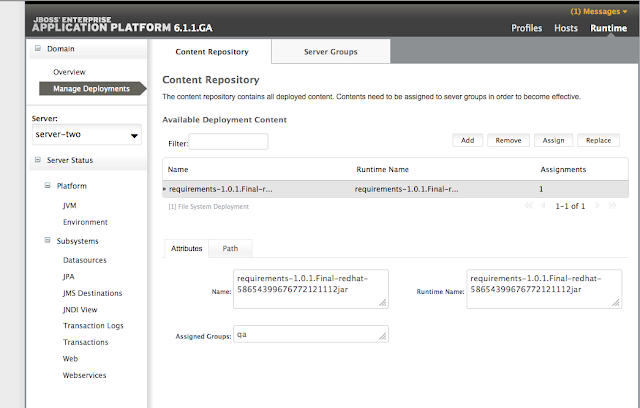 In this blog post we demonstrate how to deploy an application using the JBoss AS Client. Where admin/admin123! are the credentials to log into the remote domain. The DTGov deployment service can deploy to a JBoss Domain. Look here if you need more information on how set one up. 2. Open the domain/configuration/host.xml file for editing, and assign servers to this group. In this example we add 'server-one' to the 'qa' domain group. You want to add more then one server. You can test your credentials (admin/admin123!) by logging into the management console, which in this case would run on http://192.168.1.31:9990, and/or using the client: bin/jboss-cli.sh. You may have to add an admin user using the bin/add-user.sh script. Also verify that you see the 'qa' domain group in the management console. This means that the dtgov is invoked the jboss client on the 'qa' domain to deploy the application, where '0e7a209c-f298-433c-b9a6-3d40d4ac2f5c' is the UUID of the application artifact that will get deployed. If something is wrong at this point you can use your favorite REST client tool and perform POST's to this url until things work. I hope this worked for you too, and that you picked a better artifact then I did as deploying the requirements from the dtgov-demos-project doesn't really make a whole lot of sense! Well other then demonstrating that it works :).